So to the Fifth Element, which, Luc Besson mistakenly thought was Love. We know better, love is the first, fundamental element: which left a bit of a mystery of what the fifth element could be? There was some suggest that Ie refereed to Example, the popular rapper and singer, whose “Changed The Way You Kiss Me” certainly underpinned much of last year to me. And seemed be used a LOT at the 20/20 Cricket match I went to yesterday to signify the end of an over. But of course Ie is Latin for “that is” rather than for example, which you should look out for if there is an element called Eg (Example’s own initials, fact fans). So surprisingly Ie turned out to be Internet Explorer. The browser. Now its cultural number of 5 is not to suggest this is IE5 – though is we are talking about the Browser wars of the early noughties, IE5 is a very significant player. Rather Internet Explorer and all that it represents both on the web and away from it. Because we are a critical juncture where browser usage statistic suggest there some time around now, Internet Explorer will finally lose its place as the market leader. Look at the graph! A bit of a come down from the 95% near dominance of 2002. What does this mean? Internet Explorer has been the white bread of the internet, the default. Rarely cutting edge, often a bit buggy and the developers nightmare, it nevertheless was the browser that worked out of the box. Because it was in the box in the first place. This is what worried the EU in their famous monopoly court case on this. What this really represents is the appification of computing. What Microsoft were banking on, and most operating system players do, is that most computer users are using the browsers as a tool. The improvement of the browsing experience with other browsers is not enough to lure most people because Internet Explorer, like a battery chicken, is good enough. And once you are used to an interface, human nature breeds inertia so that we don’t change. FreakyTrigger users buck this trend. Unsurprisingly for a site that has been around for twelve years, its users appear to have toyed with other browsers. Interestingly the big four browsers all come in close (we have a lot Mac/Safari users! ), but many of our readers sit squarely in the now inertia prone Firefox users. And yet Chrome is overtaking it, right about now. What is the cautionary tale here? Well firstly, nothing lasts forever. When a company has 95% market share of anything, you might think the game is over. Yet first Firefox, and particularly Chrome have completely stolen a march on it. Looking at the graph its pretty clear where all those Chrome users are coming from. And they aren’t jumping to Chrome because it is necessarily better than IE. They aren’t doing it because of the swanky ads (though when a browser starts advertising they must be getting worried). Is it just that Chrome works better with all of Google’s embedded web-applications, or so many people use Google web applications that they can’t miss it being pimped at them constantly? To them computing now equals Google rather than Microsoft? So what does Internet Explorer represent then? Inertia, going with the flow? Maybe, but it also represents THE INTERNET in its purest form. If the internet is about information, you should need any specialist knowledge to access it. You should be able to reach as soon as you are connected. Is my extension loaded Firefox internet experience any better than my Dad’s who uses IE and wouldn’t dream of tinkering with the machine it comes with? Obviously he felt he had no choice, but if he had been given a choice, he probably would have explored the internet with the program that told him to do just that. 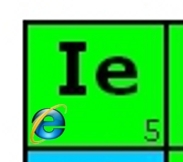 So perhaps IE also represents the Ronseal principle. It does exactly what it says on the tin. I’m using IE at work, but when I’m home I use Firefox. Funny, you should mention inertia, because I’m starting to use Chrome as a secondary browser (I believe Tumblr looks and performs better using the Chrome browser, even better than Firefox). Also, I find YouTube performs better using Chrome. Is this because I’m getting bored with Firefox? I guess I am to a certain degree. Their updates and patches sometimes have to be applied manually from their download site, which is bothersome. Maybe I’m just a sucker for prettiness. I’ve just switched back to Firefox from Chrome (which was freezing way too much) and I’ve heard other people saying they’ve done the same. I had a Chrome moment or two, but returned to Firefox recently – seems stable and my customisation all seems to work better. I have always felt bad for people trapped with IE (particularly IE6) at work for so long.